Following the success of the West End production, a Broadway production debuted on November 16, 2006 at the New Amsterdam Theatre after previews from October 14. Broadway performer Ashley Brown was brought on board to play the title role, and Gavin Lee, who had originated the role of Bert in the West End production, reprised his role in the Broadway production. The rest of the original cast included Daniel H. Jenkins as George Banks, Rebecca Luker as Winifred Banks, Katherine Doherty, Kathryn Fraughnan, and Delaney Moro as Jane Banks, and Matthew Gumley, Alexander Scheitinger, and Henry Hodges as Michael Banks. Starting on 9 October 2008, the role of Mary was played by Scarlett Strallen and Bert was played by Adam Fiorentino. Laura Michelle Kelly, who originated the role of Mary in London, officially took over the role on Broadway on October 12, 2009. Tony Award nominee Christian Borle joined the cast the same day as Bert. Nicolas Dromard will replace Borle on July 16, 2010, on a limited engagement through August 22, 2010. 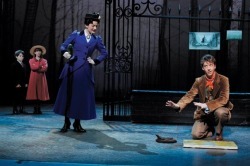 The Broadway production differed from the London production in that the "Jolly Holiday" sequence was staged in full technicolour instead of the gray tones of the London show, and in "Anything Can Happen" the stairs to the heavens were replaced by a large version of Mary Poppins' umbrella entering from the stage floor. These changes were later transferred back to the West End production.